In a sad reflection of the state of rugby league, a rare pack of signed 1995 Kangaroos footy cards sold for a paltry $4.48 on eBay last night. The market analyst firm ClarityCapital compiled a report on the auction price of rugby league paraphernalia on eBay and found that bids for retro rugby league items had more than halved in just five years, on average. The firm found that a set of glow-in-the-dark Canberra Raiders ‘pogs’ was sold for to an Philadelphia-based Australian expat in 2006 for $38.00, but an identical set went for just $8.37 to a buyer in Queanbeyan last week. At time of publishing, a signed Paul Sironen jersey sat at $16.00 with just five minutes left on the bidding clock, having not attracted a single bidder. Earlier in the week a napkin that allegedly had been used by ex-Origin prop David Gillespie at a post-match function – according to ‘try09bears’, a seller with a 100% feedback rating – was listed at the BuyItNow price of $1.20. To give context, a similar signed product in 2006 – a beer coaster that Noa Nadruku had famously used immediately before his well-documented ’22 schooners and one bottle of wine’ rampage in the mid-90s – sparked a 12-way bidding war, finally bought for $84.40 by an unknown buyer. “You know the market is slow when great products that once attracted multiple buyers are now sitting there without attracting a solitary bidder,” said the report’s prinicipal analyst, Nick Marshall. The news is not good for those punters who held out on selling rugby league paraphernalia in the hope that it would appreciate in value over time. Despite the grim forecast, Hill remained hopeful that his product – and rugby league products in general – would once again attract an interested buying market. 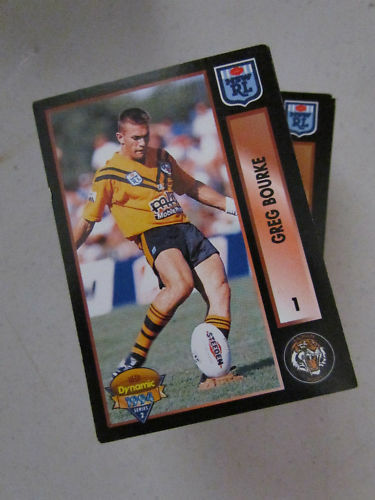 No Comments on "Rugby league cards depreciating in time: analyst"
Interesting to see that Rugby League cards are dropping in price? We specialise in pre 1995 cards and are finding it hard to supply the demand!Card boxes from 1990 to 1994 are disappearing,so demand for this period is INCREASING.Despite constant price increases in boxes for 1992 from just $40 5 years ago to over $195 now,demand far out strips supply.Card sets and singles are similar. Ebay is an auction site were the sellers have the philosophy “Im desperate please come and take this item from me!”Perhaps that explains the drop.